Many patients with multiple sclerosis have difficulty with balance and gait and are prone to falls, which can be injurious. The SafeGait 360 Balance and Mobility Trainer from Gorbel Medical is designed to aid individuals with balance and gait through training exercises. Offered as a complete system, the SafeGait 360 provides a rail system, an actuator, a strap & spreader bar, a harness, and a software management kit to facilitate 1:1 interactions between therapists and patients to help patients regain their independence. Gorbel, Inc. created Gorbel Medical using their expertise in overhead material handling, ergonomic lifting, and industrial fall protection. Gorbel Medical works with individual centers to set up rehabilitation systems for the centers’ patients. Within Gorbel’s Technology Center, there is a facility called The Gaitway Center, which was designed as a conference and education space. 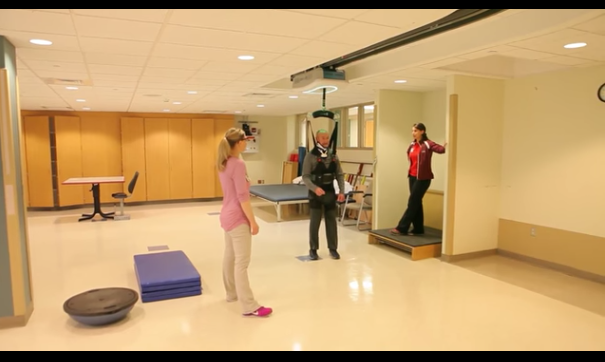 The hub brings together researchers, clinicians, therapists, and patients to advance patient care and improve on the SafeGait system. The SafeGait ACTIVE Dynamic Mobility Trainer was designed as a complementary system to the SafeGait 360 Balance and Mobility Trainer to protect both patients and their therapists during fall management exercises. Patients are safely harnessed into the system and are able to complete their therapists’ treatment plans. The exclusive Dynamic Fall Protection technology of the mobility trainer detects when a patient is falling and intervenes. The SafeGait EMBRACE Rehabilitation Harness is designed to be a more comfortable harness for use during fall management. Ordinary harnesses may ride up into uncomfortable places on the body, but the SafeGait EMBRACE is padded and provides support in alternative areas of the body. SafeGait EMBRACE can be used with both the 360 Balance and Mobility Trainer or the Active Dynamic Mobility Trainer.